The song talks about having “high hopes” and that with those high hopes a great deal can be accomplished that does not, from appearances, seem to be possible. Much of life revolves around confronting the impossible and often what is labeled impossible has as much to do with lack of confidence as it does with lack of ability. Of course there are probably many things we do not have the skills or abilities to accomplish, but why begin by assuming that a beguiling challenge is beyond us; why do we not first try to prove to ourselves we cannot do a thing rather than assume we cannot? 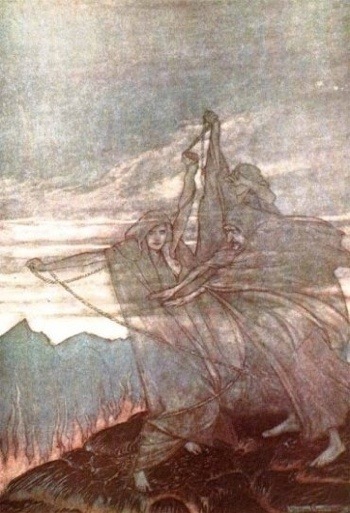 The Norns in the painting above represent fate or destiny. These are familiar figures in the myth and folklore of many parts of the world. In the German myths the Norns were, as were the Fates in the myths of Greece and Rome, weavers who wove the tapestries of individual lives and when a life was done, they cut the thread and the tapestry that was that individual life was finished. But how was the tapestry created. Did the Norns weave into the tapestry what an individual accomplished or did the tapestry come first, preordaining what that individual would accomplish? 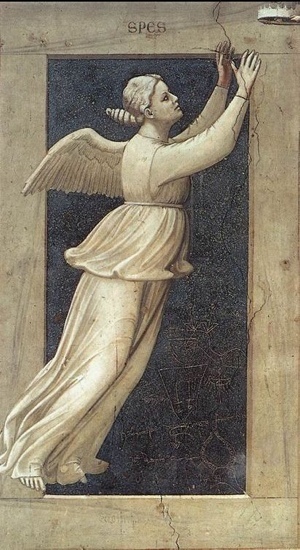 It probably does not make much difference which came first, the tapestry or the acts that were woven into it, what is important is that the action is done, that the attempt is made. We will find out soon enough if it is our “destiny” or not and if it is not there are other “destinies” to pursue. Succeeding at most things involves taking something we hope for or dream of and making it real, bringing it to pass. Often the difference between something hoped for and a goal is planning, figuring out how to get to where we want to go, or at least planning out the first few steps on the journey, perhaps its just figuring out where to start. Hope often has more to do with yearning than with planning, but perhaps often hope is where goal setting begins. It is after all one of the “Seven Virtues.” There was an article in The Boston Globe a few weeks ago, “The bright side of wrong” about the importance of making mistakes, of being willing to get it wrong. The article suggests that a great deal of success is the product of intuition, of insight into a problem or a project that is instantaneous and does not appear to be the product of careful thought. Sometimes decisions have to be made quickly and there is no time to “think things through.” We know many things and our minds can process the many things we know quickly and often what seems the product of intuition is the result of a kind of sorting process our minds can complete with speed and efficiency. “To change how we think about wrongness, we must start by understanding how we get things right. This reasoning process, even when it is applied to much more complicated problems than the neck of a giraffe, is a reliable one more often than not for most of us. The more one has learned the more this is probably true. We have to be willing to live with the embarrassment that comes from getting it wrong from time to time if we are to enjoy the success that comes from getting it right at some crucial moment. It also means running the risk of getting it wrong in one of those crucial moments. The paintings above and below depict The Garden of Eden, the one above of Adam and Eve enjoying the garden and the one below of them being sent out of the garden, after getting it wrong in what was for them a crucial moment. 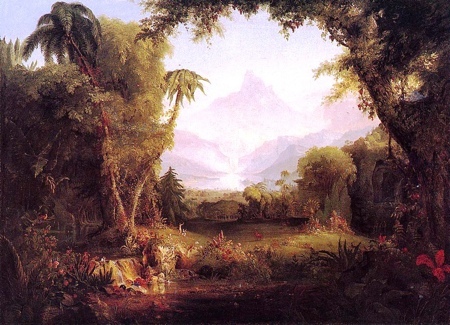 Cole’s vision of paradise may not be your vision of paradise but most of us know what it is to have attained and lost something beautiful, something secure and life sustaining. There is a sense that every major disappointment is a lose of paradise, something we have hung our hopes on has been denied, maybe it is losing an important game, getting a poor grade on a test we thought we were ready for. Maybe it is losing a job or failing to achieve a goal. Unlike Adam and Eve’s loss, though, most of our disappointments lose a bit of their significance with time and reflection. If we are wise we realize we must reassess if we are to be happy, it is important to feel the disappointment as a part of the healing process, but it is also important to grow beyond it. Fyodor Dostoyevsky was celebrated as Russia’s greatest author upon the publication of his first novel. His second novel was published two weeks later and he was labeled among one of Russia’s worst writers, the praise had turned to scorn. He became insufferably cocky after his first book was published and well received. After his fall from grace fifteen days later he never recovered his confidence, though he did indeed go on to become one of Russia’s greatest novelists. His first book wasn’t as good as everyone said it was and his second book may not have been as bad, but the work of his maturity is recognized by most as truly great and part of what made it great probably lies somewhere in that earlier success and failure. 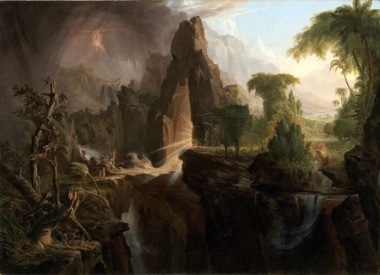 When Adam and Eve lost paradise it was for them truly lost. For us, though, it is often a bit different. It is not unusual for people to set their sights too low, to settle for something less because it appears to be easily achievable. We, often, must lose an inadequate conception of paradise, through disappointment perhaps, to wake up to a truer more worthy view of paradise. Of course it could as easily happen that the fruit of our disappointment is to give up on paradise altogether. Still, I think there is a place for looking at failure as a kind of gift that puts us on a more rewarding path; a path more in keeping with our gifts and temperament. The video is a TED Talk about the Hurdy-gurdy. As the clip suggests it is an odd instrument. My first exposure to the hurdy-gurdy was in the film Captains Courageous. Manuel, a Portugese fisherman played by Spencer Tracy in the film, plays the hurdy-gurdy to pass the long times of inactivity at sea. When I saw the instrument being played in the film I thought it could only play one tune; that it worked like a music box playing a pre-programmed song. From the video I learned that it is in fact an instrument that can play any tune, though its inner workings are odd and unlike any other instrument I know of. Learning is often like this, it surprises us, it draws us out of preconceptions and introduces us to new ways the world, or those things in it, work. Learning often opens the mind by teaching us something new about those things we believed we already knew, if not all there was to be known, at least all that was worth knowing. This is another way that hope is kept alive and “high hopes” are reawakened. The closer we get to learning all that is worth learning, the less interesting life becomes. It is often the surprises in life that keep it from becoming mundane and when we reach a place where we think we know all that is worth knowing we begin to believe there are no more surprises and this can be disheartening. 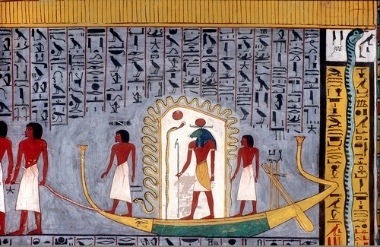 The painting below is of Ra setting forth on his nightly cruise of the underworld. This journey takes Ra through night and the land of the dead to the next morning and the world’s recreation. Each day the world is made anew and brings with it new possibilities. There is a sense that the failures of the previous day have been put behind us and we start the new day with not just renewed energy, but perhaps with new abilities or beliefs in existing abilities we did not possess the day before. There was a review recently in The Guardian, “On Evil by Terry Eagleton,” of a book on evil by Terry Eagleton. The book is something of a paradox. Eagleton a Marxist, and one would assume, perhaps incorrectly, an atheist, has written a book on preserving the idea of evil as it is understood from, if not a Christian, at least a religions perspective. But the issue here is not evil, but a reminder that we can never quite know who all of our friends are and that sometimes discovering a friend can come as something of a surprise. Insights of this sort, too, recreate the world for us, because they make it a bit less hostile. Of course these insights can also go in the other direction and expose enemies we once believed were friends. Still, the knowledge does us good and is probably worth having. It is a good thing to learn stuff, the good stuff and the bad. Learning can renew hope, and it can make us wiser if we use that learning to pursue wisdom. 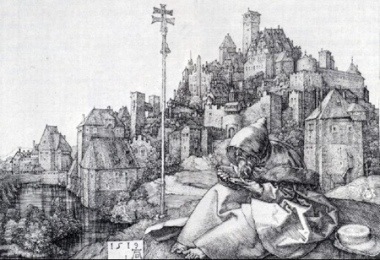 In the drawing below St. Anthony is reading a book. Reading is one of the conventional means by which learning is attained, though it is certainly not the only means. Still, if we are to read well when we open a book, it helps to open our minds first. i completely agree with this topic, seeing as how if you believe you can do something, you should try as best as you can to achieve your goal. if you don’t believe you can achieve than you’re only setting yourself up for failure, but if you believe, you will do so much better at whatever you are trying to do. like they say, “failure to plan, planning to fail.” that being said, never give up on yourself, never look less upon yourself, and always pick out the good things in life, especially such things as how you can achieve, what you can do to make your achieving better, and how to learn form your mistakes. There is a lot of things that you talked about here in this blog that are very intriguing. The one thing I would like to comment on, is where you talk about getting things wrong. I compleely agree with you. Sometimes the best way to learn something is by getting it wrong. I know that when applying this to school its completely true. If i get something right away and don’t get it wrong, I don’t put close to the amount of time I do if i’m not understanding something and getting it wrong. In putting this time and effort in improving my mistakes I now know that subject more than any other one. I very much agree with everything that was said in this blog. Having confidence in what you want to do is half the battle. If you truly believe that you can do something, then you will have a much better chance at succeeding. Without confidence, and without belief in yourself, your chances of succeeding in the things that you want to do are severely lower than if you do. It is true that no matter, how hard something is to achieve, it is much easier if you think you can do it. If you go into something with a mindset that you will fail, then of course, you probably will fail. A sincere belief in yourself and your abilities makes a huge difference in the long run. I firmly believe that our destiny in life is written by ourselves and was not predetermined when we were born. I do agree that what holds us back from achieving great things in life is our confidence or lack of. It is the fear of failure and persecution that keeps us from doing great things in our lives as said by Maryanne Williamson “Our deepest fear is not that we are inadequate. Our deepest fear is that we are powerful beyond measure. It is our light, not our darkness, that frightens us most.” We fear what we can really do because no one wants to become and outsider because of their gift whatever that might.So to protect ourselves we hide our gift. There are instances in life that we are afraid to try because we are afraid to fail but to do nothing is failure to try and fail is progress. If we choose to live our lives in mediocrity we will just “get through life” but who in their right mind just wants to get through it? Is it a chore to live? For some it might be but still we must enjoy life and not be afraid of the light we have in ourselves because it is that light that will make us remembered long after we are gone. I agree with the above comment from Zach about how our fear of failure prevents us from doing a lot of the things we are capable of. There is nothing to fear about most things, especially failure. That fear of failing is actually our lack of confidence in ourselves. Having confidence in yourself, enough to do whats needed but not too much as to not seem cocky, is a necessity to get things done in life. Also, I must add, it is comical when you are signing this song in class. I agree with this blog for many reasons. In being a teenager, I learned how to correct some of my mistakes and how to make a better decision next time. I would not of been able to do this if I did not make the mistake in the first place. Life is all about trial and error. You sometimes do things that you think is right but in the end you realize it was not helping you to succeed. In order to succeed, you have to try and that is what this blog is about. The blog definatly reaches out to me expecially the part about “high hopes.” I agree with this because people who do have high hopes and great out looks on life are more likely to succeed rather than people who do not have high hopes. Having made many mistakes in my childhood I’m brought to the conclusion that this blog is very true. When you are younger you make the mistake of putting your hand on a hot stove. When you are a little bit older you make the mistake of shifting your weight too much on a two wheeler and falling over. When we make it to our teenage years we make the mistake of running over the curb a few times when learning how to drive, we also make mistakes of taking on a little too much then we can handle. Speaking from this point in my life I don’t regret those mistakes, I learned to be careful around hot things in the kitchen, I learned to ride a two wheel bike, I learned to drive without hitting too many things 🙂 but most importantly all of these mistakes have shaped me into who I am today. If I had not taken the risk to learn to drive I would still be on the two wheeler and if I had not taken the risk to ride without training wheels I would still be on the tricycle. All of these risks had to be taken to get where I am today and more risks will be encountered as I apply to colleges as well as make a family and a career for myself, because every step of life has risks that we must take.